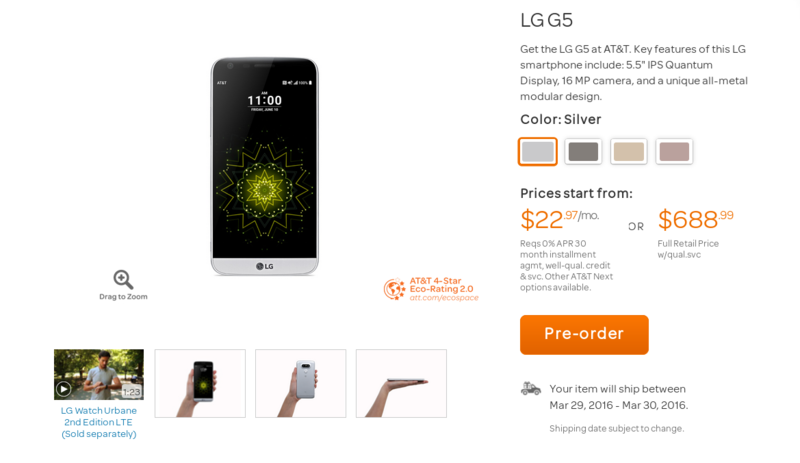 The LG G5 is coming. Judging from this weekend's poll, quite a few of you are dead set on buying this phone as soon as you get the chance. For those of you on AT&T, that time is now. The carrier has started accepting pre-orders for the phone, which will become available in stores starting April 1st. The phone's price begins at $688.99. This is not a small price tag. As we see better products coming out at the low-end and mid-range areas of the market, the high-end is apparently working its way up. If you feel better splitting big numbers into smaller numbers, you can opt to pay $22.97 for 30 months instead. Orders are scheduled to go out March 29th - 30th. Four colors are available: silver, titanium, gold, and pink. These pre-orders are set to go out March 29th. Those of you who buy a phone on AT&T Next can also get an LG Watch Urbane 2 LTE for $99 with a two-year contract. That's more of a deal for AT&T than for you, but if you were planning on doing this anyway, then you can come out saving a hundred bucks. Best Buy is accepting pre-orders, too, if for whatever reason you don't want to go through AT&T's website. Best Buy's prices aren't any different, but the option is there if you want to use PayPal or have some Reward Zone points lying around. 3TV content varies by pkg & location. Not all channels available. Data charges, add’l fees & restrictions may apply. 5Data charges apply to text messages sent and received through smartwatch via NumberSync.